I started kindergarten at the ripe old age of 6. It was my first lone venture into the world. Okay, maybe not so lone. My mommy came along. You see, until then, I had never been apart from my mother. She was a stay at home mom (or as we called it back in the 70's, "a mom".) She took me everywhere with her. I never had a babysitter nor I was ever left with relatives. No, I was attached at the hip to my mother. You can imagine the look on my face when the whole topic of going to school came up. "What do you mean you drop me off and leave me alone in a room full of strangers?" There were other issues, of course. Although I was born in the United States, my parents were not. They had immigrated long before I came around, but were still in the process of acclimating. They spoke rudimentary English, enough to get by in NYC, but almost exclusively spoke in Spanish to each other and to other members of the family. I say "almost exclusively" because they were both fans of cussing in English, but that is a story for another day. My point in this diversion is to explain that until the age of 6, I spoke only Spanish. I understood very little English. What I knew, I learned from Sesame Street and the cartoons of the day. When Kindergarten came into play, I found myself being abandoned by my mother, in a room full of strangers who did not understand me, and who I could not understand myself. I felt like an alien. I felt like a baby. So I made like a baby and cried until they called my mommy in to calm me down. After that, my mother began her unpaid career of "Teacher Helper" for my Kindergarten class. I stopped crying, and started to acclimate myself. Soon I made friends and learn the language...but if my mom ever mentioned retiring from being a helper....waterworks. One Thursday, on the way home from class, my mom mentioned needing something from the stationary store a block away from the school. It was an old fashioned pharmacy/stationary store/ 5 & Dime kind of place. It's still there in one incarnation or another, if Google Streetview is to be trusted. While my mom did what she had to, I found myself staring into the glass display counter. It was the first time in my life I ever saw the Schleich Smurf PVC figurines. My mom must have been silently observing me as I went one by one and examined the little blue elves, because she came up behind me and in a soft voice asked if I wanted one, I could have one. Not because I particularly like baking or baking-like activities. 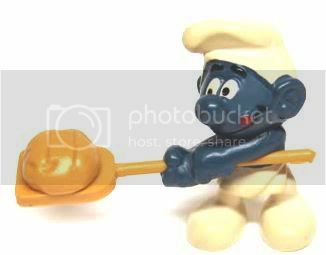 Honestly, I thought he was some sort of digger Smurf with a shovel. Only when I got him home did I realize that it wasn't dirt, but a loaf of bread that he held. I felt a little stupid, but that lasted only for a little bit. The very next Thursday, on our walk home from school my mom turns to me asks if I wanted to stop by stationary store to look at some more Smurfs. Well, ya I wanted to look at more Smurfs! If I behave myself, get good grades, refrain from crying and act like a big girl...every Thursday I will get a new Smurf. I behaved myself. I got straight A's. I didn't cry. And ...I got a Smurf every Thursday without fail for at least 2 years.